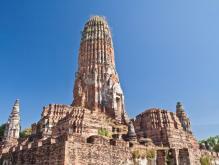 Considered as the largest remained ancient temple in Ayutthaya, Wat Phra Ram was constructed on the cremation site of the first Ayutthayan monarch, King Ramathibodi I. Wat Phra Ram is a restored ruin located in the Historical Park of Ayutthaya close to the Grand Palace and Wat Phra Sri Sanphet. The principal part is the round tower lying on the stair-stepping platform. Though it was destroyed and ruined, it still preserves the walking-and-standing-state Buddha. It consists of one huge prang and some smaller chedi and outbuildings, all in disrepair though the top of prang is complete. Staircases to the side of the prang give views of Ayutthaya. Land on the two largest islands of Thailand - Phuket & Samui, to have a taste of Thailand's amazing coastal landscape and splendid seashore life. A tour exploring Thailand's abundant history, nature and folk that is filled with variety, surprise and excitement. The tour serves you with a real appearance of this amazing land full of interests and ease. A tour impresses you with close touch to Northern Thailand's extraordinary inheritance and attractive custom shows. You will be shocked by numerous magnificent temples and palaces as well as interesting activities in this tour. A tour you can overlook at the amazing historic interests and natural scenes and participate in exciting activities in Thailand. A special experience to appreciate Bangkok's original appearance and savor its unique culture and custom. A spectacular tour of experiencing the charm of historic interests and leisure seashore. Guide for Thailand tour, offers most value & amazing experience. IndochinaTourGuide.Com. Your reliable Thailand tour agency.